Anhinga is the common name for members of the bird species Anhinga anhinga of the darter family, Anhingidae. Also known as snakebird, darter, and water turkey, the anhinga is a large bird found in freshwater environments in tropical, subtropical, and warmer temperate zones of the Americas. Anhinga is also the genus name comprising several species of long-necked birds with sharp, pointed bills found in warmer environments around the globe. 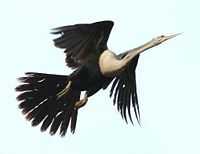 There are four extant (living) species in this genus: Anhinga anhinga, Anhinga melanogaster (Indian darter), Anhinga rufa (African darter), and Anhinga novaehollandiae (Australian darter), although the three Old World darters often are lumped together as subspecies of Anhinga melanogaster. The words anhinga, darter, and snakebird often are employed as common names for all members of the Anhinga genus, the only surviving genus in the Anhingidae family. 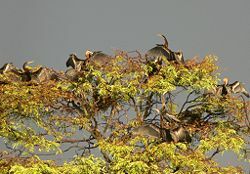 While advancing their own individual need for self-maintenance and reproduction, anhingas also contribute value to the ecosystem and to humans. They are integral to food chains and help to keep prey populations, particularly fish, in check. For humans, they add greatly to the wonder of nature, with their beautiful plumage and unique swimming and flying behaviors. The darters or snakebirds comprising the genus Anhinga (family Anhingidae, order Pelecaniformes) frequent freshwater ponds, swamps, and lakes. The name snakebird is a function of their swimming nearly submerged with just their snakelike head and long, thin, curved neck exposed. The name darter is applicable to their means of capturing prey by quickly spearing the fish with their sharp bills, which they then flip in the air and swallow head-first (NHPT 2007). Various authorities recognized one to four extant species. Commonly, two species are recognized, Anhinga anhinga and Anhinga melanogaster. Some raise two subspecies of Anhinga melanogaster to the level of species: Anhinga rufa in Africa, and Anhinga novaehollandiae in Australia, with A. melanogaster limited to those species in the Orient. Some recognize only one species, Anhinga anhinga, with the others being geographical variants. Overall, darters are circum-equatorial, tropical or subtropical. They inhabit either fresh or brackish water and can be found in lakes, rivers, marshes, swamps, estuaries, bays, lagoons, and mangrove swamps. They tend to gather in flocks sometimes up to about 100 birds but are highly territorial when breeding. Most are sedentary and do not migrate, however the populations at extreme distributions may migrate. The Oriental darter is near-threatened species, while the African darter or Levant darter, Anhinga rufa. is considered to be critically endangered (ZMA 2007). Habitat destruction along with other human interferences is among the main reasons for a declining population. The darters are large birds with dimorphic plumage. The males have black and dark brown plumage, an erectile crest on the nape, and a larger bill than the female. The females have a much paler plumage, especially on the neck and underparts. Both have gray stippling on long scapulars and upper wing coverts. The sharply pointed bill has serrated edges. The darters have completely webbed feet, and their legs are short and set far back on the body. Their plumage is somewhat permeable, like that of cormorants, and they spread their wings to dry after diving. Vocalizations include a clicking or rattling when flying or perching. During breeding adults sometimes have caw or hissing calls. Darters feed mainly on fish. Their ventral keel is present on the five to seven vertebrae, which allows for muscles to attach so that they are able to project their bill forward like a spear. Sometimes they spear the fish so hard that they have to bang the fish on a rock to dislodge (NHPT 2007). Darters also eat amphibians, such as frogs and newts; reptiles, such as snakes and turtles; and invertebrates, such as insects, shrimp, and mollusks. These birds use their feet to move underwater and quietly stalk and ambush their prey. The darters are monogamous and pair bond during the breeding season. There are many different types of displays used for mating, including male displays to attract the female, greeting displays between the male and female, and pair bonding displays between the pairs. Also during breeding, their small gular sac changes from pink or yellow to black and the bare facial skin turns to turquoise from a yellow or yellow-green color. They usually breed in colonies. Breeding can be seasonal or year round and varies by geographic range. The nests are made of twigs and are built in trees or reeds, often near water. The clutch size is two to six eggs (usually about four) of a pale green color and the eggs are incubated for 25 to 30 days. The eggs hatch asynchronously. Bi-parental care is given and the young are considered altricial. They reach sexual maturity by about two years. These birds generally live to around nine years. The anhinga is a large, cormorant-like bird with a long, S-shaped neck, an a long pointed bill. It is found in the Americas, breeding from North Carolina in the United States southward through the coastal states into Central America and South America (CLO 2007). It winters from Florida and Louisiana southward (CLO 2007). 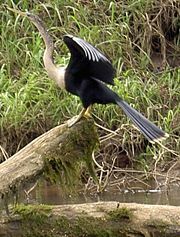 Beside being known as a darter and snakebird, it also is known as the water turkey for its broad, fan-shaped tail (CLO 2007). The anhinga has an average body length of 85 centimeters (35 inches), ranging from 75 to 95 centimeters, and has a wingspan of about 109 centimeters (43 inches) (CLO 2007). It weighs about 1,350 grams (47.66 ounces). The anhinga is a graceful flier and can travel like the Turkey Vulture in that it can go long distances without flapping its wings (CLO 2007). The male anhinga has grayish-black feathers with a greenish shine, and the wings have silver-white feathers on the top side (NW 2007). Females have a light tan head, neck, and chest and have a black stomach (NHPT 2007). The anhinga's feathers are not waterproofed by oils like those of ducks, and can get waterlogged, causing the bird to become barely buoyant. However, this allows it to dive easily and search for fish under the water. It can stay down for significant periods. 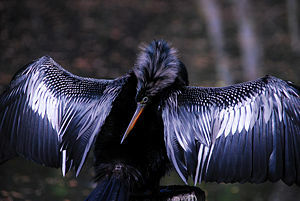 When necessary, the Anhinga will dry out its wings and feathers. It will perch for long periods with its wings spread to allow the drying process, as do cormorants. If it attempts to fly while its wings are wet, it has great difficulty getting off the water and takes off by flapping vigorously while "running" on the water. Anhinga will often search for food in small groups. It nests in a tree, where the female lays three to five light blue eggs that hatch after about one month (NHPT 2007). The anhinga's breeding plumage has a blue ring around their eyes (NHPT 2007). BirdLife International. 2004. Anhinga anhinga. Retrieved May 12, 2006. Database entry includes justification for why this species is of least concern. Cornell Lab of Ornithology (CLO). 2007. Anhinga. All About Birds. Retrieved September 25, 2007. Georgia Museum of Natural History and Georgia Department of Natural Resources. 2000. Order: Pelicaniformes. Georgia Wildlife Web. Retrieved August 30, 2006. Lockwood, B. 2006. Pelecaniformes. Fresno Chaffee Zoo. Retrieved August 30, 2006. Miller, A. H. 1966. An evaluation of the fossil anhingas of Australia. Condor 68(4): 315-320. Retrieved September 25, 2007. Myers P., R. Espinosa, C. S. Parr, T. Jones, G. S. Hammond, and T. A. Dewey. 2006. Anhingidae. The Animal Diversity Web (online). Retrieved August 29, 2006. New Hampshire Public Television (NHPT). 2007. Anhinga: Anhinga anhinga. NatureWorks. Retrieved September 25, 2007. Olson, S. L. 1975. An evaluation of the supposed Anhinga of Mauritius. Auk 92: 374-376. Retrieved September 25, 2007. Zoological Museum Amsterdam (ZMA). 2007. Catalogue of threatened and extinct species. Zoological Museum Amsterdam. Retrieved September 25, 2007. Anhinga videos on the Internet Bird Collection. This page was last modified on 22 March 2016, at 14:57.